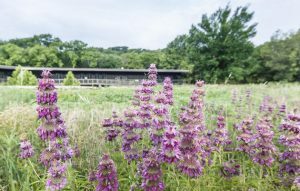 The Audubon nature center is nestled at the mouth of the Dogwood Canyon, an uplift of the Balcones (White Rock) Escarpment. Through the incredible vision of many partners, this ecosystem has been preserved for the public to enjoy and learn about, whether a seasoned naturalist or a family just beginning their foray into nature. National Audubon Society, a non-profit conservation organization that has been protecting bird species and their habitat since 1905, owns the center and owns and manages over 200 acres of nearly pristine wildlife habitat within this canyon. Audubon Dallas and the City of Cedar Hill also have land within the center’s boundary. Cedar Hill is the highest point, at about 850 feet, in North Texas. The canyon is home to a wide variety of plants and animals, including special species such as Flowering Dogwoods, Trout Lilies, Hexalectris Orchids, bobcats, coyotes, 95 migrating and resident bird species, reptiles, and many more. Within Audubon boundaries, vistas at an elevation of 750 feet afford views across the canyon and Joe Pool Lake. The Center is open to the public Tuesday-Saturday, 9am-5pm, and provides science education to over 7,500 students, public programs, kayaking, and family events. 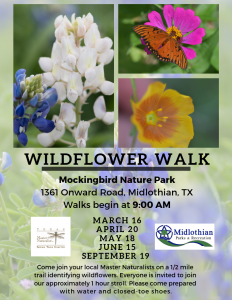 Amenities include 2 miles of hiking trails, a children’s Nature Play area, animal ambassadors, including an American Kestrel, picnic tables, bird viewing areas, wheelchair access, room rentals, restrooms, native plant garden and a nature store. Most opportunities are available in 3 to 5 hour shifts, depending on the activity. Training is available and applications are required, including an additional background check by Audubon (no charge). The center is a peaceful respite from our busy urban areas. The corridor along FM 1382 provides grand views in this hilly topography and is a great place to relax. Dogwood Canyon is proud to be part of the City of Cedar Hill’s sustainable initiative in keeping 20% of its landmass as green space. 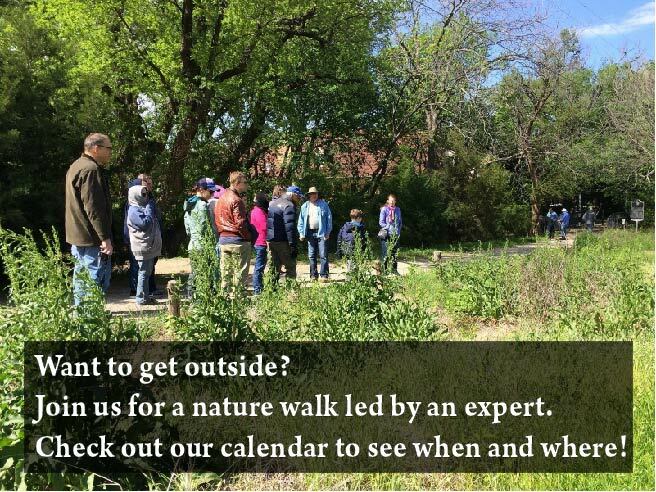 Dogwood Canyon and Trinity River Audubon Centers are managed by the state office of Audubon Texas. All Audubon Centers are part of the National Audubon Society, promoting the same mission of protecting birds where they call home, today and tomorrow. To see more pictures of Dogwood Canyon please go here: Dogwood Canyon album.